Note: New Photos Included! Reliable Internet Access Acquired. 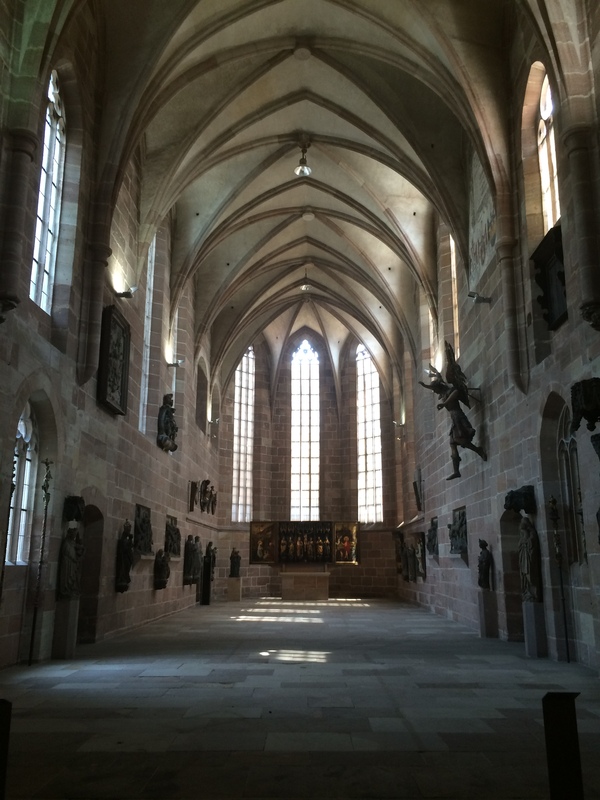 Nuremberg, I said jokingly to a friend after I arrived, is like the Tennessee of Germany. It’s very hot here in the summer, there’s a big tourist center with good music, and the region is made up demographically of some pretty conservative folks. Bavaria – Munich largely excepted – is extremely conservative. The shops are closed on Sundays and by 8pm every other night; there are local curfew and noise ordinances in place, so there’s little to no partying going on. The area seems to be a major destination for people from China and Korea, and this is the first stop along my trip that seems to be a favorite for older Americans, as well (you’ll recall that I stayed out of the former West Berlin, of course). 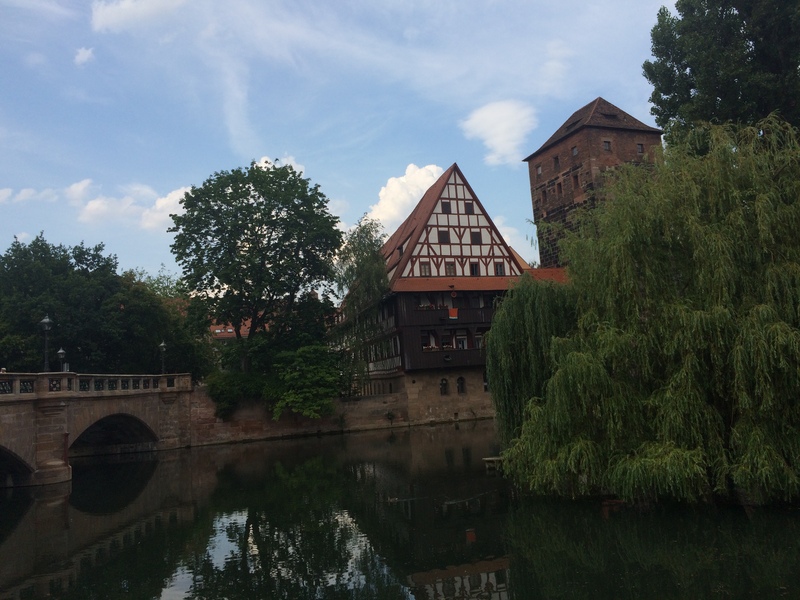 Nuremberg is a city that wrestles noticeably with its Nazi past. It was Hitler’s favorite German city and was host to party rallies from the mid 1920s onward. These included the biggest of rallies, and this “most German of cities” was the site at which the disturbing and perfectly crafted propaganda film Triumph des Willen (Triumph of the Will) was filmed. The effects of its favored status for the Third Reich as well as of the subsequent Allied bombing raids are evident in many places in and out of the heart of town. In the center of the town, one of the three major churches is still being reconstructed, and the other has on one of its walls a photo of the building after the war – chilling reminders of the destruction wrought by the conflict. The Nazi Party rally grounds and the zeppelin field are about a half an hour’s tram or S-Bahn ride out of town, though they’re actually not so far as the crow flies. I visited the Documentation Center, the modern museum built into a partially constructed, coliseum like building Hitler had ordered built for the party’s use. It and its surrounding areas were the sites of the massive rallies we see on documentaries about the horrors of Hitler’s dominion over the German people at the time leading up to the Second World War. My experience there was interesting but really not revelatory – having visited concentration camps and Jewish ghettos in the last year, the stories and descriptions offered by the audio guide at this location weren’t anything new, nor were they particularly gritty or raw. Most of them focused on the town’s role in the history of the party. It was worth visiting the museum, though; I’d recommend it. I also visited the Germanisches Historisches Museum (my favorite museum) and walked along the outside of some of the city walls and explored some back streets. One major detractor for me at Nuremberg was the horde of tourists and shoppers at its modern city center. It’s a beautiful city, though, and worth visiting for anyone interested in a Medieval German town. Last year I visited the castle at the top of the hill that is Nuremberg, but I didn’t take the time to see it this year; nor did I walk on the top of the walls. The imperial history of the city is interesting, but I’ll leave my comments here, my 500-word limit being reached. This entry was posted in Travelogue, Travelogue 2015 and tagged Europe by Train, German History, German History Museum, germany, History, Italy, Nazi Party, Naziism, Nazis, Nuremberg, travel. Bookmark the permalink. Great photo from the Documentation Center! Takes me back to last year when we visited Nuremberg 🙂 And that is also my favorite museum. I’d love to go back one day to see the rally grounds as well as the courthouse where the Nuremberg trials took place. Great city where I’d like to see a few more things there and then will be able to cross it off my list. There just wasn’t enough time to do all of the things I would have liked to do our first time there.